A Baraita consisting of eleven paragraphs on the excellences of the Torah and on the right way to become acquainted with it. This Baraita claims to be a supplement to the treatise Abot, having as a superscription the words: "The sages taught ["shanu ḥakamin"] in the language of the Mishnah." The first part of the sentence, "The sages taught," shows that this section constitutes a Baraita which in the Talmud is cited with the formula, "The sages taught." The Baraita mentions, besides R. Meïr, author of the first sentence (whence the Baraita is known by his name), Joshua b. Levi, Simon b. Menasia, José b. Ḳisma, and Simon b. Yoḥai, whose teaching was transmitted by Simon b. Menasia or, as some versions have it, by Simon b. Judah. The mention of the amora Joshua b. Levi in a work claiming tannaite origin justifies the supposition that the redaction of this Baraita is of comparatively recent date, belonging to a time in which there no longer existed an exact knowledge of the chronology of the Tannaim and Amoraim. Most of the sayings of this Baraita, with greater or slighter variations, occur in the Babylonian and the Palestinian Talmud, and in different Midrash collections, in such a way as to make it apparent that the Baraita de-Abot is more recent than these works. 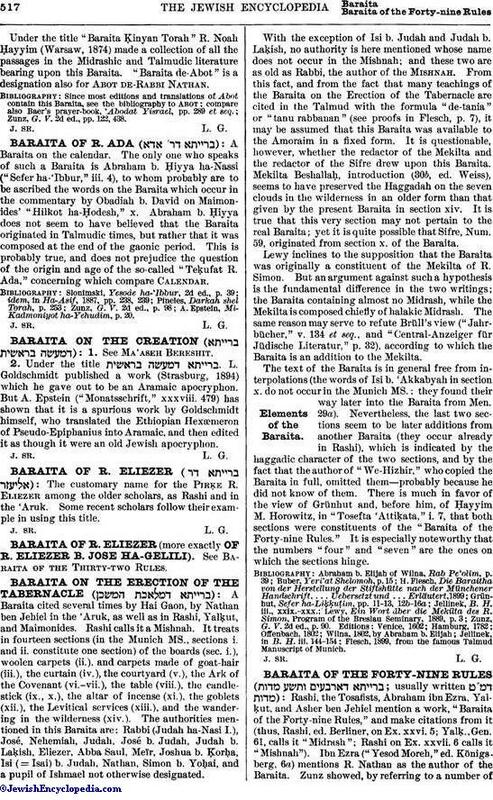 Coronel, in his "Ḥamishah Ḳunṭresim," published (Vienna, 1864), from a manuscript, a Gemara to this Baraita which was known to many of the old authorities (compare Kallah). In the edition of the Talmud by Romm, of Wilna, the Gemara is reprinted. In the middle of the ninth century, however, the Baraita already formed a part of the treatise Abot, and was recited with it in the synagogue on the Sabbath afternoon (Sar Shalom Gaon, cited in "Siddur R. Amram," 30a). This was the custom later, also, both in the Spanish and the German rituals. For the criticism of the text special regard must be paid to the seventeenth chapter of the Tanna debe Eliyahu Zuṭṭa, in which the Baraita is given in its entirety, but with different textual readings. The following two sayings may serve to illustrate its character: "Every day a voice goes forth from Mount Horeb and cries out, saying: 'Wo unto the creatures [mankind] for the insult they offer to the Law'" (ii.). "Seek not greatness for thyself, and desire not honor. Practise more than thou learnest. Lust not for the table of kings: for thy table is greater than their table, thy crown greater than their crown; and faithful is thy taskmaster who will pay thee the wage of thy work" (v.). 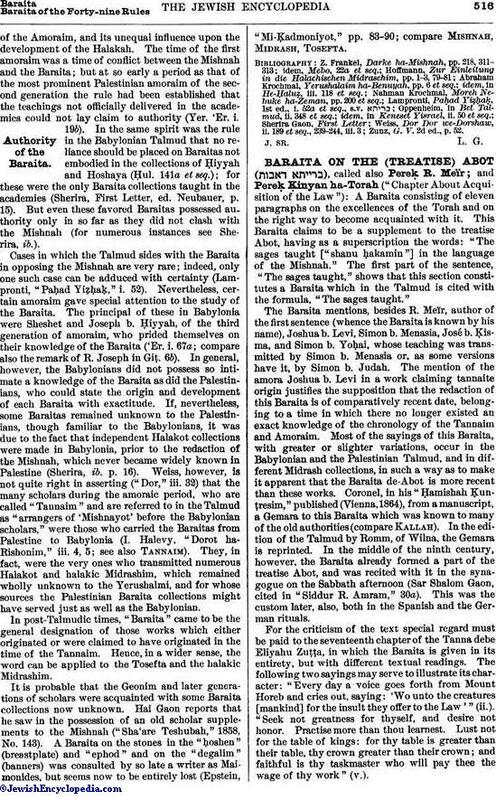 Under the title "Baraita Ḳinyan Torah" R. Noah Ḥayyim (Warsaw, 1874) made a collection of all the passages in the Midrashic and Talmudic literature bearing upon this Baraita. "Baraita de-Abot" is a designation also for Abot de-Rabbi Nathan. Zunz, G. V. 2d ed., pp. 122, 438.